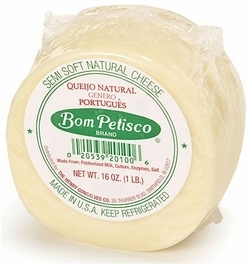 Home Local Favorites Bom Petisco Cheese 16 oz. You must select 2-Day or Next Day shipping. Bom Petisco Cheese is shipped to ensure your order arrives by Friday and does not get hung up in transit over a weekend period. Goes great with crushed pepper. Semi soft natural cheese. Net Wt. 6 oz. The shelf life is approximately 6-9 months from date of manufacturer.